This Big Buddha hobo bag is no shrinking violet! 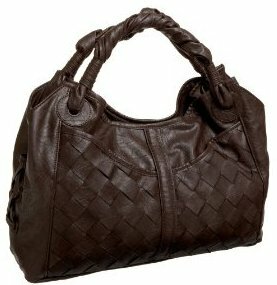 With its large size and chunky accents, the Kirsten is made to get noticed. The Kirsten's traditional slouchy hobo shape gives it a relaxed vibe, perfect for those lazy weekend lunches with the girls. The synthetic's natural textured finish looks just like leather, but is so much kinder on the planet and your purse strings. The Kirsten's woven detailing and funky side laces make it stand out from the pack. Pop open the magnetic closure to reveal the playful polka-dot lined interior. It's made for overstuffing, with plenty of space and soft side walls. We all know it's easy to lose your essentials at the bottom of an oversized bag, so the inner zip pocket and front slip pockets are lifesavers. Loosely braided straps feel silky soft on your shoulder while maintaining the Kirsten's laid-back charm.